It's always a surprise when it happens these days, but in a way it's never a surprise. Another Eichler home, or a modest mid-century modern tract home—often in Palo Alto but in nearby towns too—bites the dust. "You don't learn anything until a sign goes up in front of a house saying a new house will be built there," says Frank Ingle, who has seen that happen twice. Ingle, who lives on Richardson Court in Palo Alto, watched as the Eichler next door was replaced with a two-story home that looks down onto his. Then a sign went up announcing a similar fate for a home directly across the street. 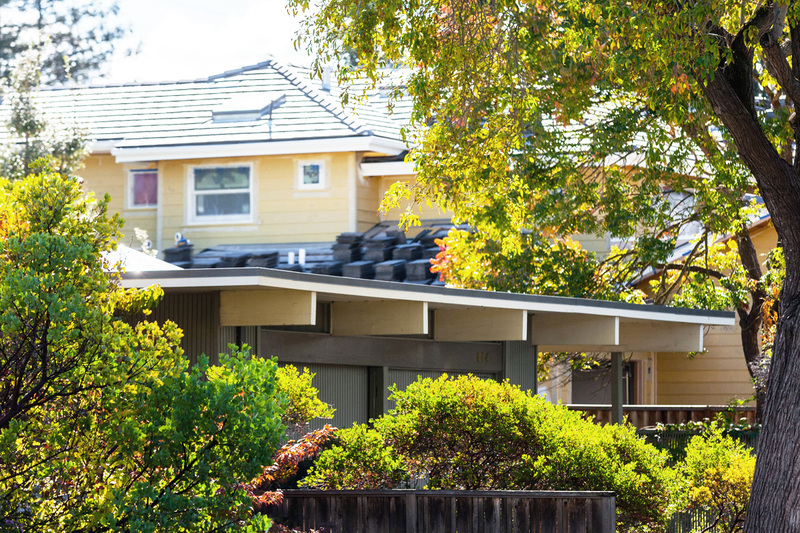 Throughout Palo Alto and surrounding areas, teardowns and major remodeling that increase the size of homes have become increasingly common. Ingle's home dwarfed by his neighbor's. 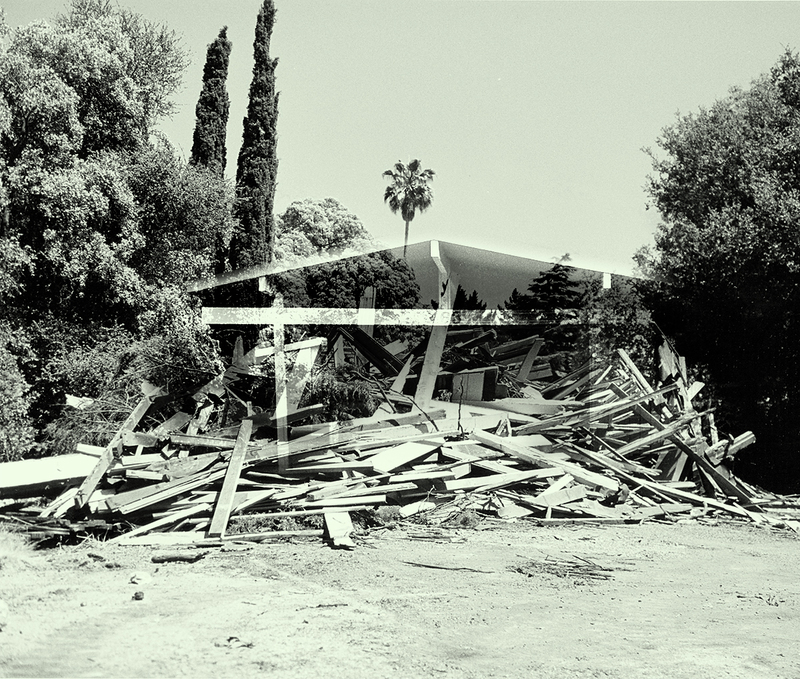 An Eichler home directly across from the Eichler Swim and Tennis Club in Palo Alto—gone. An early, rambling, and very woodsy Eichler in Atherton is destroyed—directly across from a similar Eichler that Joe himself once called home. 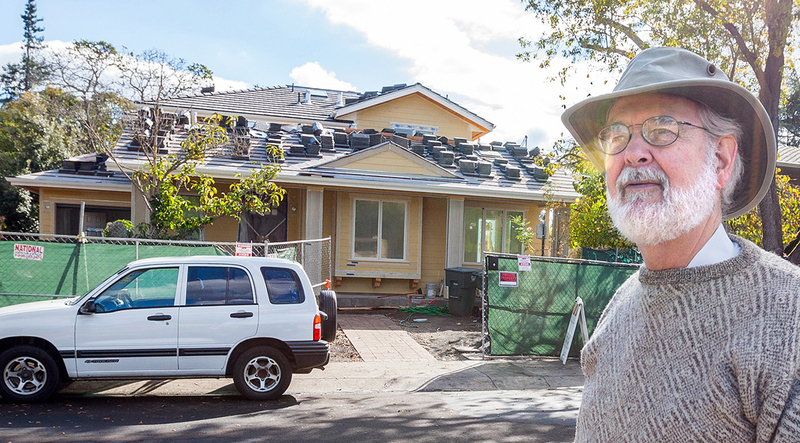 In nearby Menlo Park, fueled by "Silicon Valley types with stock options," Eichler owner Phil Friedly says, homes are ripped down by spec builders to be replaced with homes that are up to three times as large. Mackay homes too, built by a competitor of Joe Eichler using Eichler's architects Anshen and Allen, also are menaced. The most recent victim, in Santa Clara's Maywood Estates neighborhood, is not a teardown but a second-story addition that will change the character both of the once-modest modern home and of the neighborhood. And, in one of the most egregious moves, an amazing house in Atherton Anshen and Allen designed in 1957 as the family home for Elmer Gavello, another Eichler competitor who built modern tracts, was flattened to make way for an unimaginative McMansion. It had been an amazing building with a soaring star-shaped roof. What is up? As land values shoot through the roof, do houses too have to shoot up in size? Has a mental illness grasped Silicon Valley? Is it all about new money and bad taste? A kind of teardown syndrome that cannot be cured? Or—is this just normal life in America, giving the consumer what he or she needs, wants, demands? The people who live in their little Eichler homes, with their big glass walls, are they just Luddites fighting a fight that can't be won?